Using psychological theory as a basis, Socializing Children through Language examines naturally occurring conversations between mothers and children in the context of achievement, self-regulation, food consumption, and television watching to illustrate how families of different socioeconomic means interact and discuss a variety of topics in the home. 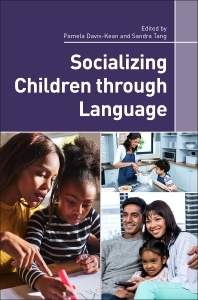 Specifically, the chapters in this book draw on enhanced audio recordings of over 40 families across a range of education and income levels to investigate how mothers’ language relates to child behaviors over time. The unique pairing of this digital observer data with empirical data on achievement tests, regulation tasks, and parenting information on the home environment collected one year later presents an altogether revolutionary way to understand and think about how family socialization works across socioeconomic levels. Dr. Davis-Kean is Professor of Psychology at the University of Michigan where her research focuses on the various pathways that the socio-economic status (SES) of parents relates to the cognitive/achievement outcomes of their children. Her primary focus is on parental educational attainment and how it can influence the development of the home environment throughout childhood, adolescence, and the transition to adulthood. Davis-Kean is also a Research Professor at the Institute for Social Research where she directs the Population, Neurodevelopment, and Genetics (PNG) program. This collaboration examines the complex transactions of brain, biology, and behavior as children and families develop across time. She is interested in how both the micro (brain and biology) and macro (family and socioeconomic conditions) aspects of development relate to cognitive changes in children across the lifespan. Dr. Tang is a Research Investigator in the Survey Research Center at the Institute for Social Research and jointly affiliated with the Psychology Department at the University of Michigan. Her program of research focuses on the role of the family, school, and environment in shaping children’s educational success, especially for those children who grow up in risky contexts. In particular, Tang is interested in the extent to which cultural and socioeconomic factors shape parenting behaviors, and in turn, children's academic outcomes.